It has been just about a year since an Alabama university formally kicked off what it claimed to be the largest high-definition video board in college sports. 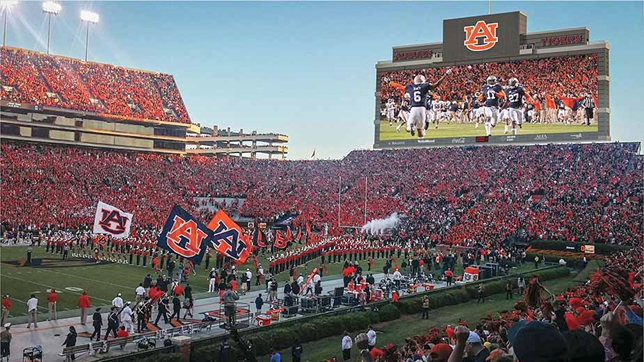 Auburn University upgraded Jordan-Hare Stadium with a $13.9 million LED video display that runs 197 feet wide by 57 feet high and uses 8.7 million LEDs, alongside a new state-of-the-art sound system. The outdoor arena holds about 87,000 people. Auburn U's new video display runs 197 feet wide by 57 feet high and uses 8.7 million LEDs. The project was designed by Daktronics. On the video side the company tapped its show control system technology, which allows the operator to show a single large image across the entire display or to break up the screen into multiple "zones" for combinations of live video, instant replays, scoring and statistics and other messaging. On the audio side the company is using Audinate's Dante Audio-over-IP, which is controlled from a central location in an audio control room. The set-up lets a single operator manage audio from CD players, microphones and other inputs, as well as audio produced in the university's video control room, located elsewhere on campus. "We use Dante on roughly 60 to 70 percent of our big-screen installations because it's extremely flexible, scalable, and configurable," said David Sturzenbecher, Daktronics audio project engineer, in a case study about the project. "Its seamless interoperability between components makes it easy to expand existing installations."